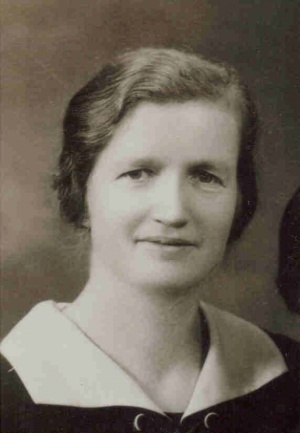 Katharina "Tina" Lepp Ewert: matron of the Bethel Girls’ Home (Mädchenheim), the Mennonite Brethren home for women in Vancouver, British Columbia (BC); born 7 February 1897 in Deyevka, Orenburg Mennonite Settlement, Russia, the second of four children of David Aron Lepp (8 November 1866 - 17 September 1948) and Katharina (Harder) Lepp (d. ca. 1903). After her mother’s death, Tina’s father married for the second time to Katharina Wolfe (1 January 1874 - 30 September 1969) and they had seven children. Tina married Isaak Ewert (6 May 1891, Gnadenau, Molotschna Mennonite Settlement, South Russia – 24 April 1972, Clearbrook, BC) on 30 October 1955 in Yarrow, BC. Tina died 8 February 1987 in the Menno Hospital in Abbotsford, BC, and was buried in Abbotsford. Tina’s parents moved from Schönhorst, Chortitza Colony to the newly established Orenburg Mennonite Settlement a year or two before Tina was born. In 1917 she and her family returned to Schönhorst, and 1923 the family immigrated to Canada. Tina and her family settled in Steinbach, Manitoba, where she was baptized. After several years she and her family moved to Coaldale, Alberta, where she joined the Coaldale Mennonite Brethren (MB) Church. In May 1935, Tina Lepp began her work as a matron of the Vancouver MB Mädchenheim (Bethel Girls’ Home). Although she felt inadequate and overwhelmed with the responsibility, she continued this work for eleven years, until June 1946. Tina was initially paid $25 a month. Time off was difficult in a house with wall-to-wall adolescent girls. Much to her chagrin, but fortunate for us, she was asked to report in writing to Zionsbote, and she was also required to present reports in person at the bi-annual Church Conferences held in British Columbia. One of the first entries, in June 1935, the Minutes of the BC Mennonite Brethren Conference presents the following: "Sister Lepp reports that she has been working in the Home for the past six weeks. When the call came to take over this work she felt very unworthy to do so. She felt that she was not the suitable person for the task but since it was the Lord who called, it is her desire to be faithful and obedient." Tina Lepp’s "faithfulness" and "obedience" in those early days is described in Zionsbote. Tina recounts her responsibility for 30 new girls, in addition to 90 regular workers. In a city, culture and language foreign to her, she finds it difficult to provide the young girls with directions and streetcar information, never mind the countless other tasks she must perform. Her concern for the girls never wanes. Several years later, on 25 October 1939, Tina describes helping a fourteen year old find her employer’s home. The young girl hugs Tina and hangs on to her, begging her not to leave. Tina reports her sad thoughts on the street car as she had to leave the girl at her place of work. Yet other girls present different challenges: one of them she names her "Sorgenkind" (problem child). Tina could not have managed without reliable assistance and Mary Thiessen provided this for many years. In November 1940, a minister reports that "Because Sister Lepp is attending Bible School, Sister Mary Thiessen has taken her place in the Home." Again, in June 1942, a minister notes that "Sister Lepp assisted by Mary Thiessen, quietly and faithfully does her work." In addition to financial concerns, the spiritual welfare of her "girls" was a worry of the Tina’s as well as the parents and church members. In May 1945, Sister Lepp reminds the conference participants that every Thursday evening (which is the maids’ time off) "the Gospel is clearly proclaimed. Attendance at these meetings is between thirty and forty." For these meetings, the girls brought sack lunches, they sang, they listened to visiting ministers’ sermons, and they played board games if time allowed. After eleven years of full time responsibility, in June 1946 a minister at the conference reported that “Sister Lepp is retiring and.… we recommend a gift of $5 per month for her eleven years of service.” Although other matrons followed Tina, and also provided nurture and care for the many women domestic workers, the absence of Tina Lepp in the Girls’ Home of Vancouver left a void for many – "like the sky without the sun." After her work in Vancouver was completed, Tina moved to Yarrow where she operated a small berry and chicken farm with her sister Anna. In 1955 Tina married Isaak Ewert, a widower with a number of children whose first wife Sara had passed away in January of that year. Tina and her new family lived in Yarrow until 1967 when Tina and Isaak retired to Clearbrook, BC. Derksen Siemens, Ruth. "Quilt as Text and Text as Quilt: The Influence of Genre in the Mennonite Girls’ Home of Vancouver (1930-60)." Journal of Mennonite Studies 17 (1999): 118-129. Epp, Marlene. “The Mennonite Girls' Homes of Winnipeg: A Home Away From Home.” Journal of Mennonite Studies (1988): 100-114. Klippenstein, Frieda Esau. "’Doing what We Could’: Mennonite Domestic Servants in Winnipeg, 1920-1950." Journal of Mennonite Studies (1989): 145-166. Mennonite Brethren Herald (20 March 1987): 35. Mennonitische Rundschau (24 May 1972): 11. Strong-Boag, Veronica. New Day Recalled: Lives of Girls and Women in English Canada 1919-1939. Ontario: Penguin, 1988. Valverde, Mariana. Age of Light, Soap and Water: Moral Reform in English Canada 1885-1925. Toronto: McClelland & Stewart, 1991. Derksen Siemens, Ruth. "Lepp Ewert, Katharina "Tina" (1897-1987)." Global Anabaptist Mennonite Encyclopedia Online. 2006. Web. 19 Apr 2019. http://gameo.org/index.php?title=Lepp_Ewert,_Katharina_%22Tina%22_(1897-1987)&oldid=143079. Derksen Siemens, Ruth. (2006). Lepp Ewert, Katharina "Tina" (1897-1987). Global Anabaptist Mennonite Encyclopedia Online. Retrieved 19 April 2019, from http://gameo.org/index.php?title=Lepp_Ewert,_Katharina_%22Tina%22_(1897-1987)&oldid=143079.